With nearly a month passing from the savage massacre of camp Ashraf residents, the 7 hostages, who were abducted by the Iraqi forces that carried out the raid, are still missing, and the Iraqi government still refuses to release them and futilely tries to deny having them in its custody. Protesters, hunger strikers, dignitaries and human rights figures across the world are unanimously calling on the US and UN to stand up to their obligations and put pressure on the Iraqi government to release the hostages. 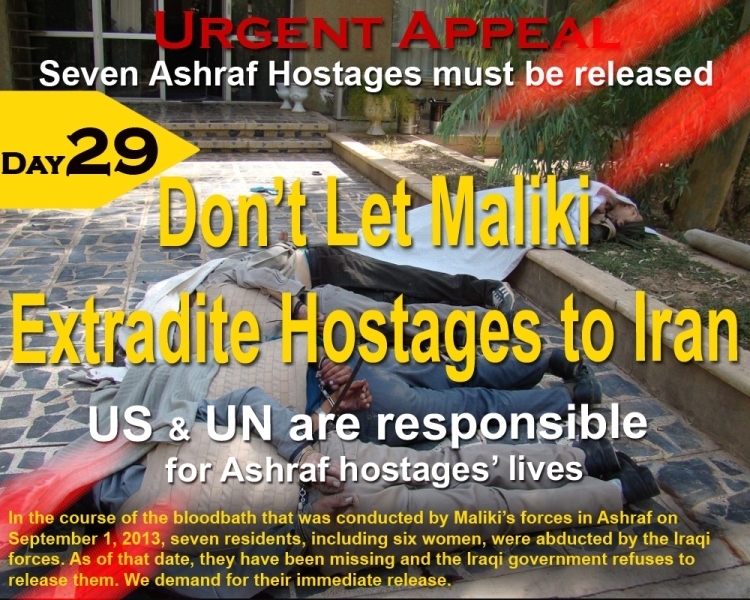 They are outraged that, while there is ample evidence that the hostages are in the hands of Maliki, the Iraqi government is resorting to a scenario of disinformation to deceive the US, UN and international community into believing that the hostages aren’t in Iraq. The United States is responsible for the safety and security of the hostages and must act quickly and effectively to ensure their safe release and their return to camp Liberty.